The Millau Viaduct is the world’s tallest cable-stayed bridge. Proposed by Eiffage, this structure in steel pylon and deck structure represents a first in terms of its original method of constructing an exceptional-scale bridge. “The Millau Viaduct ranks among our most brilliant civil engineering achievements. It is a magnificent example of our research and technology… It symbolizes calculated risk and performance serving the interests of the greatest number of people.” French President Jacques Chirac on 14/12/2004. 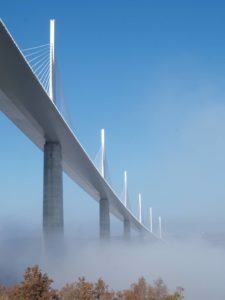 Eiffage made a bid to finance, build and operate the Millau Viaduct (a 2.5 km long cable-stayed bridge). At the end of the competitive process, the French Ministry of Equipment selected Eiffage as the prime contractor for this exceptional work, with an estimated cost of FF2 billion. - Assistance provided to Eiffage on technical aspects (supervising structural/environmental calculations, toll barrier design: civil engineering, operating equipment, telecoms etc.). - SETEC also provided expertise in traffic/revenue studies in the call for tender phase. - A design role including on-site monitoring and calculations on the stability of the geotechnical structures. - Detailed Inspection & life cycle maintenance. The highlights of this exceptional viaduct project include the pillar construction, the assembly and the lifting of the deck. To achieve these feats, setec provided Eiffage with its sophisticated software enabling a detailed analysis of the impact of the wind on the structure and the phases involved in lifting the metal deck. The company also offered the latest developments in Pythagore software for a non-linear analysis of the reinforced concrete pillars and the stability of the steel sheets in compliance with Eurocode standards.